The Engineering and Development branch exists to provide the best possible communications systems and remote sensing design and equipment available for support of interagency incident communications. This section works both within the NIICD and in the field environment. Field work consists of field testing equipment and operational support for actual all-risk incidents. Testing and redesign of operational installed systems are also included in this branch's duties and responsibilities. NIICD's engineering staff is currently part of the U.S. Department of the Interior's (DOI) government-wide Digital Narrowband Radio Contract Team. 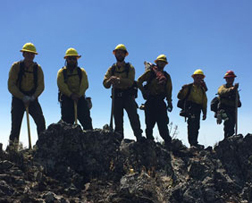 Efforts include serving as the national interagency wildland fire technical representative to DOI's contract committee and test team, in addition to functioning as the federal wildland fire and aviation's technical expert on EIA/TIA-102 (APCO Project 25) digital technologies. The branch engineer is also a member of the Telecommunications Industry Association's (TIA) Land Mobile Radio Committee (TR8) for digital radios.